It's a cold, blustery day here today. We've been under a winter storm since early morning and have received probably six inches of snow so far. We've yet to see a snow plow to clear the roads, so I hope they do eventually show up so we have clear roads for travel to work in the morning. Speaking of work, my countdown widget tells me I only have 17 calendar days left before I retire. Taking away the weekends and the Christmas holiday, I actually have only 11 work days left. It seems surreal that I am retiring, but I am looking forward to it and having more time to do the things I love. I used a blender pen dipped in Perfect Plum ink to color my flowers, and a marker in Mellow Moss for the stem and leaves. After I stamped the floral image by Rubbernecker, I then took a blender pen to add shading to the image. I sponged Certainly Celery on the deckled portion. Yesterday, I posted some monogram gift cards I made. Today, I was inspired to make two more cards for that little collection. These were quick and easy! I love this flourished embossing folder by Cuttlebug. 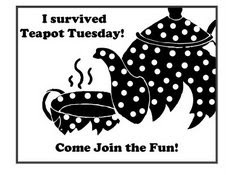 I cut the designer paper (Stampin' Up) to fit the rectangle within the embossed flourish. I heat embossed the JustRite monogrammed letter and cut the circle with my circle Nestability. 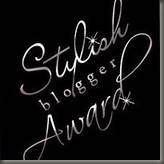 While I was in the midst of writing this post, I received a message from a dear stamping friend, Kathy (also known as 101Airborne on Splitcoaststampers, that she was awarding me the Stylish Blogger Award. 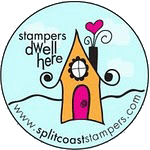 Kathy has a darling blog called Entering Kathyville and she is really terrific about being supportive of other stampers through her encouraging comments on cards. Now, I'm suppose to tell 8 things about myself upon receiving this award. 1. I have held a job in one capacity or another since I was 14 years old and feel very blessed that I can retire at such a young age!! 2. I have no respect for people who think they are better than others. 3. I love birds, penguins, polkadots, music, movies, reading, designing greeting cards, and m&ms! 4. I won a Carol Burnett Act Alike Award from my drama classmates when I was in high school. I use to be able to do her Tarzan yell. 5. As a child, I dreamed of becoming a famous actress. 6. I've always been a neat and clean freak, but find myself being kinder to myself and family by trying to relax some of my standards. It isn't easy. 7. I've been to Disney World every year for the past 15 years because it makes my husband happy. 8. I use to love to golf, bowl, and play the piano until arthritis claimed my finger joints. Thanks for the award and kind words, Kathy! 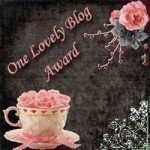 Thank, YOU, for stopping by and visiting my blog! you stay inside and nice and warm AND...if those plows don't come, just stay home....with only 11 days left what are they gonna do to ya if you don't show up on a bad travel day.....eh????? absolutely gorgeous cards! i mean gorgeous! holy moly! are we sisters? except for the tarzan yell, i do the same things. work since age 14, retired early, wanting to be famous (singer); neat & clean freak. wowza!!! oh you are gonna love retirement. you will have NO time. trust me. you had more time when you worked!!! you were on a schedule. there is NO schedule in retirement and NO time to have one. BIG CONGRATULATIONS. enjoy!!! These are beautiful Charlene.. You must be so excited for this new stage of your life..
Wowza! Charlene, the first card is just gorgeous! The other two are simply elegant. So happy you are looking forward to retirement! Fabulous! Charlene, you are going to love retirement! When I first retired, I loved staying warm and cozy curled up in bed, rather fighting the traffic and snow getting to work. I tend to view retirement as every day is a Saturday... you are going to love it! I see you created more beautiful monogram cards to add to your gift set and your SCS card for the featured stamper is drop dead gorgeous! Love the delicate flowers and your design is a knockout! Great cards, Charlene!....but oh my word, I have to say that the floral card is totally STUNNING! Love Love LOVE it! you are fabulous gf...love those beautiful cards...the monograms are simple stunners and the first one is soo beautiful! Oh Charlene, Congratulations! I am so happy and excited for you! Your FS card is just divine! I love what you did to keep her original, but also make it your own! Beautiful monograms too! Wow! 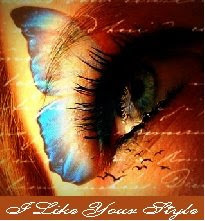 Charlene, your first card is so beautiful...I stared at it for a long time, it just draws you in!! And what a cool gift your monogrammed cards will be for your customer, exquisite!! I loved reading your facts, and was so interested in all the newsy things I did not know...I can picture you being a look a like for Carol Burnett...that is so funny!! One of my favorite comediennes and ladies!! So happy for you with your countdown, you'll be entering a new stage and one I am sure you will make the most of! These are gorgeous Charlene!! I just love your embossing on all of these! My fave is the first one with the embossed Nesties, the shading and your white background with the sentiment and flowers.